In “High Fidelity”, Rob Gordon asks the profound question: “Did I listen to pop music because I was miserable, or was I miserable because I listened to pop music?” The same chicken-and-egg logic applies to film box office performance: are films successful because we buy tickets, or do we buy tickets because films are successful? If tickets were bought based solely on each individual’s personal and isolated taste preferences – we would have expected this plot to be linear – meaning box office would increase proportionately with rank. But this plot is clearly non-linear. It looks logarithmic. 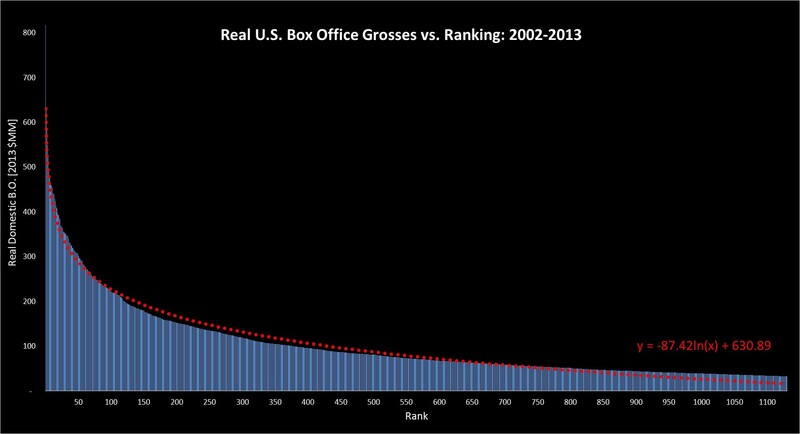 So it seems that film box office has a recursive nature, where success drives even more success in a positive feedback mechanism: the difference between rank 50 and 60 is much bigger than the difference between 60 and 70. I call it “The Rob Gordon Effect” (ironic, because this character was kind of a loser). There are many possible explanations, but I think if we’re honest with ourselves, we do make decisions based on news of success or failure: a breakout box office phenomenon is an “event” we all want to be part of. Nobody wants to be one of those people who haven’t seen Avatar, and no one wants to be mocked at the office for being the only person who was so out of touch to actually pay to see Johnny Depp’s “Lone Ranger”. Everyone wants to be associated with the winners, making it very hard for perceived underdogs to triumph. It’s not very romantic, but it’s true. Ok, that was part 1. From here on, it’s all unnecessary brain drilling. The conclusion of all this is that the “Rob Gordon Effect” really kicks in only for mega blockbusters (over $120MM domestic gross): they are disproportionately boosted by news of their relative success. But smaller films are in fact NOT affected by such news (especially under $70MM domestic gross). Therefore – there is a threshold above which a movie gets turbo-charged by its own success. The practical takeaway for studio execs is: if your movie has a chance of breaking that threshold ($120MM as of March 2014) – you should give it that extra marketing push. It will pay off. * Raw B.O. data from boxofficemojo.com (1,131 films total).